After hearing Jane Weedon’s keynote at last year’s Content Marketing World, I knew it was time to take a deeper look at Twitch. Weedon, director of business development at Twitch, said content on the platform is still gamer-centric. But now focus is being put exploring additional interests the community has. So should your brand consider livestreaming on Twitch? 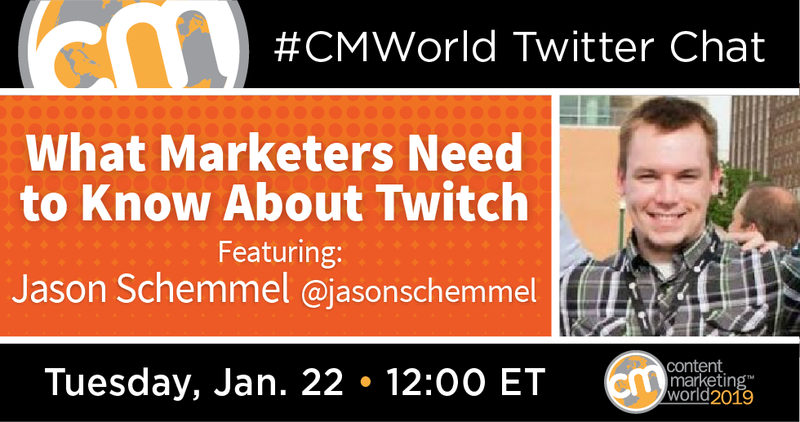 We knew there was one person in the #CMWorld community that could help us figure it out. Jason Schemmel is Social Media Manager at HarperCollins Christian Publishing. Outside of his day job, he enjoys going live from his personal Twitch channel and is building a community website for streamers. There are a lot of things to consider before streaming live on platforms like Twitch. How can it be built into your content marketing? What equipment do you need? Should you work with influencers? We had a great conversation with Jason and our chat participants, breaking it all down. What follows is a brief look at our discussion. Want to see all seven chat questions and the responses that were shared? Be sure to take a look at our Twitter Moment. Twitch is widely known to be a platform for gamers. What if your brand’s focus is not a popular topic on it? Should you continue to explore the platform? Are there industries that better lend themselves to livestreaming on Twitch than others? Impromptu livestreams can sometimes end in disaster for marketers. How can you prepare for your live video without coming across overproduced? What brands have you seen leading the way on Twitch? Let us know in the comments below. A content marketing conference would make the perfect backdrop for a livestream. CMI will be in San Diego this April for ContentTECH Summit. Discuss with like-minded marketers how to manage, deliver, and scale your content. Sign up today with discount code SM100 for $100 off Early Bird rates.